Salted Caramel is one of my favorite flavor combinations. I love anything with salted caramel. Especially chocolate. I was inspired to fill dark chocolate with salted caramel and I’m glad I did. These caramel cups are divine. I couldn’t decide if I wanted to fully enclose them in the chocolate like a traditional peanut butter cup or just drizzle some on top so I did both. I like them better with just the drizzle. You use a less chocolate and they look so pretty. The center stays soft while the chocolate hardens and the sea salt complements the sweetness. I suspect that eventually, the sugar alcohols may crystallize again but after a few days in my fridge (I was surprised they even lasted a few days) the centers were still soft. 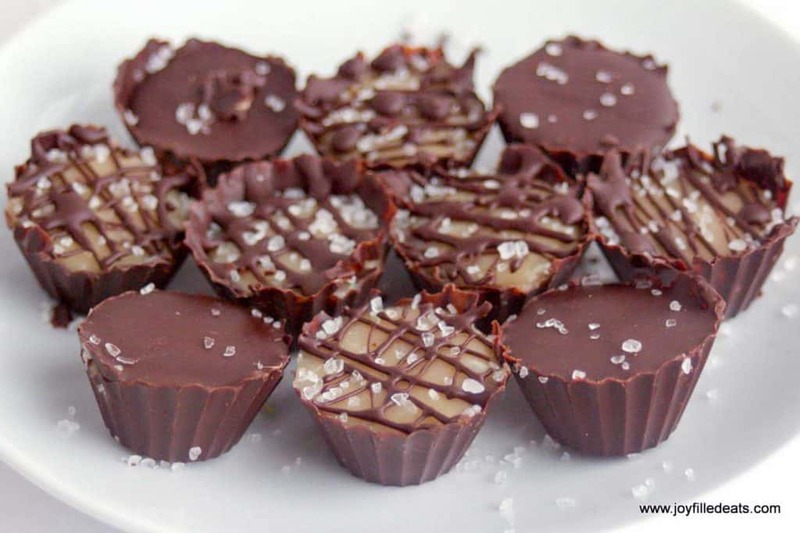 This makes a full tray of salted caramel cups with a little bit of leftover caramel. Is leftover caramel ever a bad thing? I don’t think so. Feel free to half it. If you have a different silicone mold you may need more chocolate. This is the mold I used. Salted Caramel is one of my favorite flavor combinations. I love anything with salted caramel. Especially chocolate. 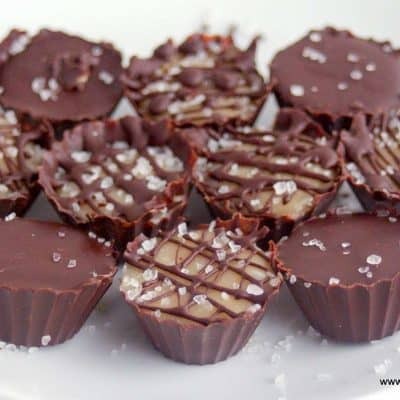 I was inspired to fill dark chocolate cups with salted caramel and I'm glad I did. They are divine. Combine the butter, cream, and sweetener in a small saucepan over medium-low heat. Cook until light brown and thickened stirring frequently. This takes 10-15 min. Stir in the extracts, cream cheese, and salt. Stir until the cream cheese is thoroughly incorporated. Set aside to cool to room temperature and thicken further. Melt the chocolate in the microwave or in a double boiler. I do it in the microwave stirring every 30 seconds. Put a little in the bottom of each mold and spread it up the sides. Put in the fridge to harden. Do one more layer of chocolate. Harden in the fridge. 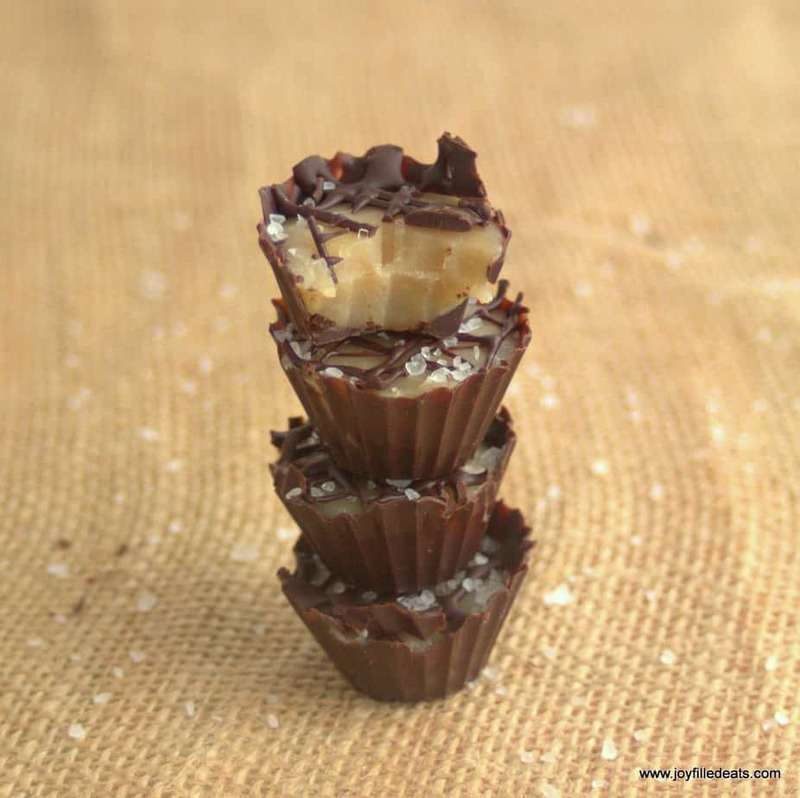 Fill the chocolate cups 3/4 full with the room temperature caramel. Put in the fridge to chill the caramel. After about 5 min it should be cool enough to put chocolate on top. You can cover the caramel or just drizzle lines on. Sprinkle with a little coarse sea salt. Store in the fridge. *** if you cover the tops with chocolate you will need the full amount, if you drizzle lines on top then the lesser amount will work. This is a game changer!!! I'm glad I waited, and made your sweetener mix. This is now my all time favorite recipe :-) Thanks for sharing. Bravo! This is a great recipe! I wondered when I was cooking the caramel mixture whether it was ever going to get light brown but it did finally after boiling for about 16-17 minutes. Then I added in the cream cheese mixture. It got to a beautiful light brown (not beige) color. Very pleased with the color and TASTE! I bought the 3 sweeteners and made your mixture. It worked great. I had a few 1/2 silicone ice trays I used for fat bombs. Worked ok unless if there was chocolate coating on all sides, but sticks if not enough chocolate coating the cube. Next time I would DEFINITELY stick to the caramel recipe you have here. Might add a little less salt. And might try with Keto chocolate bomb recipe (cocoa, coconut oil, almond butter, stevia mixture) rather than melting real chocolate. Will also be purchasing your recommended mold. THANKS for a great recipe. One of my favorite low carb treats ever! Is there anyway to use say swerve and Splenda. As the sugars. Money is tight. And those are the ones I have on hand. Not for this recipe, sorry! I'd look for a caramel recipe that uses one of those. It is very hard to change sweeteners in candy recipes. Do you know if this would work with Swerve? Thank you........beautiful candies! Thank you 😊 I have seen caramel made with swerve so it should. If you try please let me know how they turn out. Could I make these into bars? Good question Kari, I'm not sure how cutting through the caramel would be. If you don't have a mold you could make them in mini greased aluminum cupcake liners. I can't use this sweetner blend because of dogs. What do you suggest to use and how much? How much of what to make the blend? What about using pyure? The recipe for the sweetener is here: joyfilledeats.com/sweetener And, sorry, but I don't think pyure will work in this recipe. Caramel is very fussy. I made these twice and even served them to my guests for my birthday. They are mouthwatering, and everyone loved them. I absolutely love anything salted caramel! I just put my second coat of chocolate in the molds. Do these come out easily once they have chilled with the caramel in them? :) I cannot wait to try them!! Thanks for sharing this recipe! Yes! They pop right out as long as you are using silicone molds. I tried twice and can't get my carmel to brown at all! I didn't use the Mama Gentle Sweet. I used Stevia Raw and Sucralose. Neither worked. Like I said, it didn't turn anywhere close to brown and then if I kept cooking it, it just separated! I never even got to the step of adding the extract and cream cheese. Any ideas of what I'm doing wrong? You can't use those sweeteners, sorry. The sweetener I use is a blend of sugar alcohols with stevia. I would google for a caramel using sucralose if that is the sweetener you prefer you use. Especially in candy recipes you can't just swap sweeteners. Just made these. Just wow. I ate two and had to walk away. Incredible. Thank you for this recipe. Do you know the calories, fat, and carbs per one of these fat bombs? I just started a keto diet. I do not bake so my melted chocolate looked terrible and they did not turn out at all looking as gorgeous as yours...BUT they tasted amazing!!! I have to learn how to perfect it, but my family loves them as well, even though mine were gooey and falling apart. Tips? And nutritional value if possible? Rough estimate is ok. Thank you! Hi Taryn, Can't wait to try this recipe! Just wondering on the serving size for "S"??? Apologies if I just missed that. Thanks! These look super yummy! Definitely a winning flavor combination. My caramel filling seems runny what did I do wrong? You may not have cooked it long enough. Man! I did it for 15 minutes! Oh well I'll try again, thanks! I've been making chocolates for years and I use a small brush to coat the sides of my molds. Brushes can be bought at stores that sell candy making supplies. I've had mine for years. Chocolate is always messy. I like eating it much more than working with it. I put a little in the bottom and spread it up the sides with a small rubber spatula. When that hardened I did it again but the second time I just used my finger and that worked a little better. By the end I was covered in chocolate though. Lol.